Many studies are currently investigating the development of safe and effective vaccines to prevent various infectious diseases. Multiple antigen-presenting peptide vaccine systems have been developed to avoid the adverse effects associated with conventional vaccines (i.e., live-attenuated, killed or inactivated pathogens), carrier proteins and cytotoxic adjuvants. Recently, two main approaches have been used to develop multiple antigen-presenting peptide vaccine systems: (1) the addition of functional components, e.g., T-cell epitopes, cell-penetrating peptides, and lipophilic moieties; and (2) synthetic approaches using size-defined nanomaterials, e.g., self-assembling peptides, non-peptidic dendrimers, and gold nanoparticles, as antigen-displaying platforms. This review summarizes the recent experimental studies directed to the development of multiple antigen-presenting peptide vaccine systems. From the latter half of the 18th century onwards, vaccinations have saved millions of human lives and countless animals, and vaccinology contributes to the prevention of infectious diseases (e.g., polio, measles, and rubella) and antiserums for toxoids (e.g., snake bites, spider bites and jellyfish stings). However, there is a strong demand for the development of safer and more effective vaccines toward not only the prevention of many infectious diseases, e.g., human immunodeficiency virus (HIV) [1–3], malaria [4–6], group A streptococci (GAS) [7, 8], hepatitis C virus (HCV) [9, 10], and severe acute respiratory syndrome (SARS) [11, 12], but also for cancer immunotherapy [13–15]. Synthetic immunogenic peptides are ideal vaccine subunit components because of the following differences to traditional vaccines composed of live-attenuated, killed or inactivated pathogens e.g., bacteria or viruses: (1) no infectious material; (2) no cross-reactivity with host tissues; (3) induction of site-specific antibodies (Abs); (4) ability to chemically define and modify products; and (5) swift large-scale manufacturing and long-term storage in the event of a pandemic. However, the biological activity of peptides is generally short due to enzymatic degradation, and small peptides that are used as antigens are not recognized by immune cells, e.g., dendritic cells (DCs) and macrophages, and do not elicit a strong immune response when administered alone. The co-administration of adjuvants (e.g., water-in-oil emulsions, oil-in-water emulsions, liposomes, bacterial lipophilic compounds, etc.) with subunit peptide antigens is one of the methods used to enhance the immune response; however, only a few adjuvants are approved for clinical use . Alternatively, short antigenic peptides induce strong immune responses when co-administrated or engaged with carrier proteins (e.g., ovalbumin (OVA), bovine serum albumin, keyhole limpet hemocyanin, tetanus toxoid, etc. ); however, they are also associated with undesirable effects such as the suppression of the anti-peptide Ab response and the production of Abs against the carrier proteins [17–22]. Tam developed the multiple antigenic peptide (MAP) system to improve the poor immunogenicity of subunit peptide vaccines . In this MAP system, multiple copies of antigenic peptides are simultaneously bound to the α- and ε-amino groups of a non-immunogenic Lys-based dendritic scaffold (Figure 1). The protein-sized MAP molecules acquire stability from enzymatic degradation, enhanced molecular recognition by immune cells, and induction of stronger immune responses compared with small antigenic peptides. The MAP concept represented a major breakthrough for vaccine systems and further improvements in a large variety of multiple antigens-presenting peptide vaccine systems have been investigated. This review focuses on the current status of multiple antigen-presenting vaccine approaches, especially the addition of functional components and the application of a wide variety of synthetic methods and size-defined nanomaterials, e.g., self-assembling peptides, dendrimers and gold nanoparticles, as antigen-displaying platforms. Tam's MAP vaccines that carried several copies of peptide antigens on a Lys-based dendrimer induced higher Ab production than single peptide monomers and carrier protein-peptide conjugates; however, additional components, such as an adjuvant, were required in many cases. Therefore, great efforts have been directed toward improvement of these MAP vaccines by the incorporation of various functions into a single vaccine molecule using helper T-cell epitopes, immune-stimulant lipid moieties, or cell-penetrating peptides have been conducted. Antigens are taken up by antigen-presenting cells (APCs) and B-cells and undergo proteolysis to form peptide epitopes. Of them, T-cell epitopes are presented by class II molecules of the major histocompatibility complex (MHC) on the surface of APCs and B-cells. APCs activate helper T-cells by the interaction between the T-cell receptors on T-cells and the epitopes/MHC class II complexes on the surface of APCs. The activated helper T-cells recognize B-cells that have the same epitopes/MHC II complexes on their surfaces. This T-cell/B-cell interaction is the trigger for the differentiation of B-cells into plasma cells that secrete Abs. The use of certain T-cell epitopes induces strong immune responses, and carrier proteins are used as a source of helper T-cell epitopes. Subunit peptide vaccines containing only B-cell epitopes cannot always elicit strong immune responses due to a lack of T-cell activation. The incorporation of helper T-cell epitopes into MAP vaccines has been investigated [22, 24]. MAP vaccines containing B- and T-cell epitopes in a single construct induced strong immune responses and have been studied in clinical trials . Although single vaccine molecules containing B- and T-cell epitopes induced the production of Abs against the defined T-cell epitopes, in some cases, the Ab titers of the anti-T-cell epitopes were mostly lower than those of B-cell epitopes [26, 27]. A wide variety of cells including B-cells, T-cells, DCs, and macrophages express Toll-like receptors (TLRs) on their surfaces. Eleven TLRs (named simply TLR-1 to TLR-11) in human have been identified to date . TLRs are a family of pattern-recognition receptors that recognize structural components of many bacteria, viruses and fungi, and play a critical role in the early innate immune response. TLR-mediated stimulation of APCs significantly enhances the secretion of pro-inflammatory cytokines, Ab production, and immune responses and, TLR agonists may be able to be used in alternative adjuvant systems. Bacterial lipid components such as Pam3Cys (the inner and outer membrane components of gram-negative bacteria) [29, 30], and Pam2Cys (the lipid component of macrophage-activating lipopeptide 2 isolated from mycoplasma) [31, 32] as well as synthetic α-lipo amino acids [33, 34] are characterized as TLR-2 agonists and used as immune-stimulating lipophilic moieties (Figure 2) that are attached to antigenic peptides (lipopeptides). Other lipophilic compounds such as O-acyl serine, N-acyl lysine and glycolipids are also utilized for this purpose [35–37]. Lipopeptides stimulate innate immunity by their interaction with TLRs on DCs, [38–42] and elicit long-lasting systemic immune responses and T-cell proliferations [43–45], resulting in the enhanced immunogenicity of unmodified peptides by more than a few orders of magnitude. In addition, lipopeptides show none of the harmful side effects of adjuvants. Lipopeptide vaccines are currently in pre-clinical and clinical trials treating HIV and hepatitis B virus [46–48]. The incorporation of lipids with known immune-stimulating characteristics into the MAP system produces self-adjuvanting lipopeptide vaccine candidates that can induce Ab and cellular responses in the absence of additional adjuvants [33, 49–52]. Structure of immune-stimulating lipid moieties. Since the discovery of the cellular membrane translocating property of the human immunodeficiency virus transactivating regulatory protein (HIV TAT), several peptides with the ability to translocate to the plasma membrane have been identified and named as cell-penetrating peptides (CPPs). CPPs have been studied for their ability to deliver peptides/proteins [53, 54], oligonucleotides/DNA/RNA [55–58], and even much bigger molecules such as liposomes [59, 60] into the cytoplasm of cells. Fully exploiting this ability, CPPs are being utilized in vaccine studies for the delivery of antigens to APCs with the aim of antigen presentation and the induction of an immune response [61, 62]. CPP-antigen conjugates enhance the cross-penetration of antigens into DCs [63, 64]; however, CPPs function in all cell types, and a dual functionalized compound (CPP conjugation and DC targeting) that was designed in one study showed no synergistic enhancement of the immune response . As such, numerous attempts to incorporate various functional components into single molecules have been performed. One consideration for the design of multiple antigen-presenting vaccines composed of various components is their molecular geometry, i.e., altering the linkage and spatial arrangement of each component evidently influences the conformational structure (lack of α-helicity), solubility, and molecular recognition by immune cells [27, 66–71]. Zeng et al. studied the influence of diverse chemical linkages and epitope orientations on immunological activity . Either N-terminus or C-terminus of both T-cell epitope and B-cell epitope were linked via disulfate, thioether, oxime, or peptide bond. The immunological evaluation of the same epitope-containing molecules with different linkages showed unique properties in terms of their stabilities to serum and the ability to induce Abs against T-cell and/or B-cell epitopes. Abdel-Aal et al. studied the relationship between immunological activity and the structural arrangement of multiple antigens-presenting vaccine molecules with 3 components (J14 as a B-cell epitope, P25 as a CD4+ T-cell epitope, and α-lipo amino acids), showing clearly that changing the position of each component significantly affected the production of IgG Abs against B-cell epitopes and, in some cases, T-cell epitopes . In the case of the MAP systems, the number of peptide epitopes that can be incorporated into a Lys-based dendritic scaffold is limited. Furthermore, stepwise solid phase peptide synthesis (SPPS) of branching peptides such as MAPs commonly encounters the difficulty of purification to homogeneity and characterization of the final products. Using purified short peptides as building blocks, several chemoselective conjugation techniques (e.g., native chemical ligation , thioether ligation [72, 73], thiazolidine/oxazolidine ligation , oxime ligation , maleimide , and Cu(I)-catalyzed azide-alkyne cycloaddition ) have been applied to the synthesis of multiple antigen-presenting vaccines; however, the difficulties associated with the stoichiometrical stepwise incorporation of many of the same or different peptide epitopes into Lys-based dendritic scaffolds remain [73, 78–80]. Concerning the design, preparation and biological activity of multiple antigen-presenting vaccine molecules, the stoichiometric epitope density of multivalent ligands is an important parameter [81, 82]. Hence, we now introduce the alternative synthetic approaches that are used to attach multiple copies of antigenic peptides onto organic or inorganic scaffolds instead of a Lys-based dendrimer. Polymer chemistry using purified antigenic peptides is suitable to prepare multiple antigen-presenting vaccine molecules. 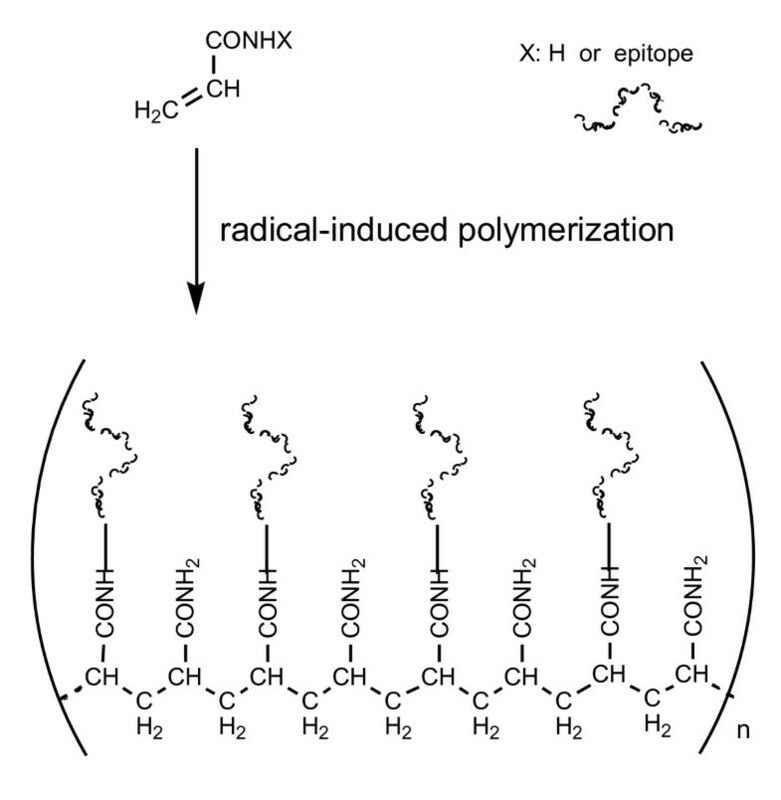 Free radical-induced polymerization of vinyl monomers is one of the most common and useful reactions for making polymers. An acryloyl (CH2 = CHCO-) group, as a key functional group for polymerization, can easily be introduced into peptides during conventional SPPS. Free radical-induced polymerization of acryloyl-peptide building blocks yields polymeric immunogens bearing hundreds of the same or different peptide epitopes attached to the alkane backbone (Figure 3) [83–86]. 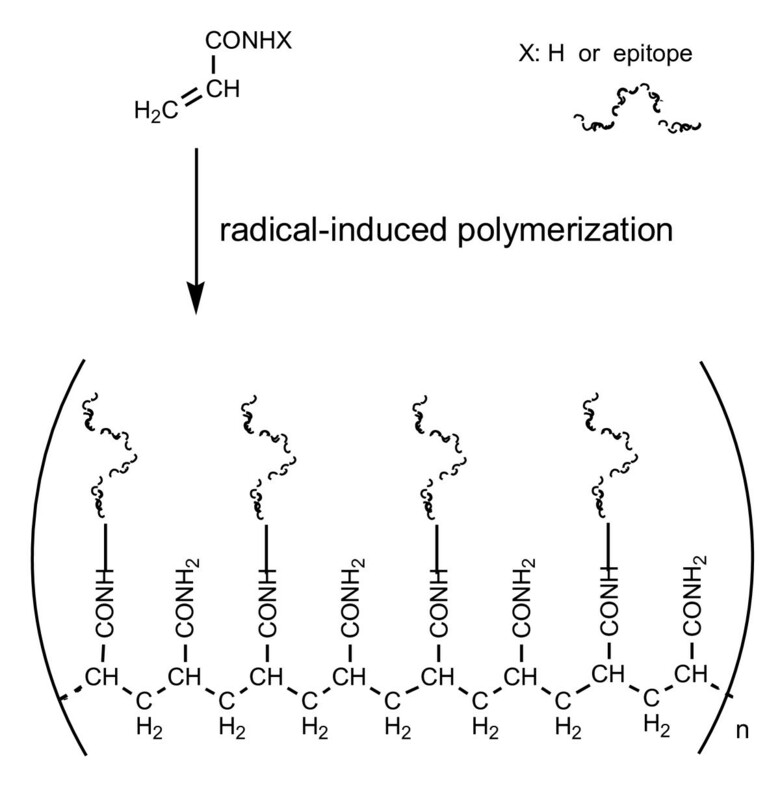 The size of the polymer construct and the distance between individual peptidic components can be controlled by the addition of acrylamide or its analog along with chain transfer agents (dithiothreitol or mercaptoacetic acid) during the polymerization process . Vaccine molecules presenting a number of epitopes on alkyl backbone formed by free radical-induced polymerization of acryloyl groups. Jackson et al. evaluated the vaccine efficacy of polymeric immunogens containing 7 B-cell epitopes (88/30, Y504S, BSA10, NS27, NS1, NS5, and PL1; the N-terminal GAS M protein sequences) and the chimeric peptide J14 (a B-cell epitope consisting of the GAS M-protein C-region and GCN4 DNA-binding protein sequence). The polymeric GAS vaccine molecules showed outstanding broad immunogenicity and protection from GAS infection in mice. Abs against each of the individual epitopes presented in the polymers were successfully elicited . Peptides with certain helical or β-hairpin/sheet secondary structures can assemble themselves to form tubular, fibrillar, or spherical structures on the nano-scale via non-covalent interactions (e.g., van der Waals bonds, electrostatic interactions, hydrogen bonds or stacking interactions). They are called self-assembling peptides and applied as topologically defined building blocks in various fields including material sciences, molecular electronics, tissue engineering, and drug delivery [87–89]. The ability of these self-assembling peptides to form nanostructures is also of great interest for a repetitive antigen display system (Figure 4). Systematic self-assembling peptide vaccine with repetitive antigens. Burkhard's group used self-assembling peptide nanoparticles composed of a pentameric coiled-coil oligomerization domain derived from cartilage oligomeric matrix protein  and a de novo trimeric coiled-coil oligomerization domain  as multiple antigen-display platforms [71, 82]. An α-helical coiled-coil B-cell epitope HRC1, derived from the SARS S protein, was then attached on the self-assembling peptide nanoparticles. Self-assembly in phosphate-buffered saline yielded nanoparticles (~ 25 nm in diameter) that exposed multiple copies of HRC1 on their surface. Circular dichroism (CD) spectra indicated that the peptide nanoparticles maintain an α-helical conformation. Immunological evaluation of the nanoparticles containing HRC1 showed specific Ab production and moderate neutralization activity of SARS coronavirus infectivity . Furthermore, immunization of mice with peptide nanoparticles bearing the malaria B-cell epitope (DPPPPNPN)2D successfully induced high Ab titers and long-lasting protection. The majority of these mice were protected against an initial challenge of parasites for up to 6 months after the last immunization or up to 15 months against a second challenge . This self-assembling peptide nanoparticle vaccine against Malaria is currently undergoing pre-clinical trial in the US. A short fibrillizing peptide Q11 self-assembles in a salt-containing aqueous solution to form networks of β-sheet-rich nanofibers with a width of 15 nm; and the resulted nanoparticles are non-cytotoxic and minimally immunogenic [92, 93]. Rudra et al. used Q11 as a multiple antigen-presenting vaccine system. Self-assembling peptide nanofibers (O-Q11), in which the OVA323-339 epitope, derived from chicken egg OVA, and Q11 were linked via a spacer, were subcutaneously administrated into mice and elicited high IgG titers in the absence of an additional adjuvant. The Ab titers were remarkably higher compared with the admixture of OVA323-339 and complete Freund's adjuvant (CFA). According to this study, Ab titers against Q11 were not determined even when it was co-administrated with CFA . The usage of a self-assembling non-peptidic dendritic polymer as an antigen-display system was recently reported. Multiple copies of J14 (B-cell epitope from the GAS M-protein) were attached on dendrimers via Cu(I)-catalyzed azide-alkyne cycloaddition and the subsequent self-assembly was carried out in water to form nanoparticles (20 nm in diameter). After subcutaneous immunization with the J14-bearing nanomolecules, several subclasses of IgG were successfully produced without any adjuvants . As an alternative to organic compounds (certain peptides or polymers), inorganic materials such as SiO2, Ag, Pt, and Au are also known to form nanoparticles. Colloidal gold nanoparticles (GNPs) are of interest for various biomedical applications [95, 96], e.g., imaging [97–99], photo-activated therapeutics , tumor detection , and drug delivery [102–104] as well as multivalent antigen carrier scaffoldings [105–107] instead of conventional carrier proteins and synthetic dendrimers/polymers. GNPs are an ideal material primarily because of their biocompatibility and lack of immunogenicity [108, 109]. GNPs can be easily prepared from gold salt (H[AuCl4]) in water and their particle sizes are controllable (ranging from 1-100 nm in diameter) [110–113]; consequently, gold surface electrodes can be readily reacted with molecules bearing a mercapto (SH) group (Figure 5). The strong attachment between the mercapto group and the gold surface is easily prepared as well as the chemoselective conjugation, e.g., native chemical ligation, click chemistry, oxime ligation, and thioether ligation [52, 72–77] of the antigenic peptide and synthetic core particles (sophisticated in some cases). The size-dependent toxicity of naked GNPs can be reduced by modifying their surfaces . The intracellular uptake of GNPs is mediated through endocytosis [115–117], enabling GNPs to deliver the attached molecules into the cell. 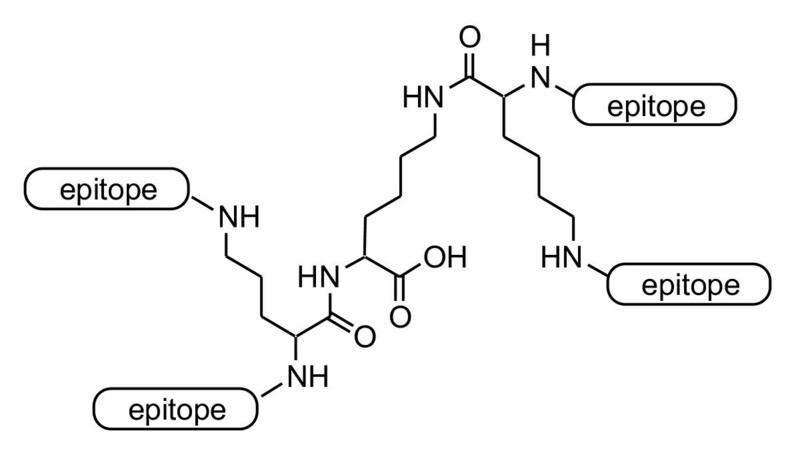 GNP-peptide conjugates resistant to enzymatic and lysosomal degradation. As such, GNPs are suitable materials to use as antigen-presenting scaffolds. Multiple antigens-presenting gold nanoparticle vaccines. Chen et al. demonstrated that the addition of extra Cys residues to the C-terminus of an epitope, derived from the VP1 protein of the foot-and-mouth disease virus, allowed its conjugation to different sized GNPs as antigen carriers. Mice that were immunized with these GNP-epitope conjugates showed significant size-dependent immunogenicity and biodistribution in the spleen . Conjugation with the Fc fragment from human IgG targeting the Fcγ receptor on human DCs into GNPs successfully enhanced the cellular uptake of antigens. In addition, GNP-epitope-Fc conjugates showed better antigen-uptake activity, immunological responses and lymphocyte proliferation compared with the use of liposomes as an antigen-delivery system . The current status of multiple antigens-presenting vaccine systems has been reviewed. Various functional components (T-helper epitopes, immune-stimulating lipids, and cell-penetrating peptides) have been attached with antigens to improve subunit peptide vaccine potentiation, such as the effective and selective activation of a particular immune system and mucosal immunity. Meanwhile, the recent use of size-defined organic and inorganic nanomaterials without either immunogenicity or cytotoxicity as antigen-display platforms surely advances the development of subunit peptide vaccines without the use of adjuvants. Each of these nanomaterials as antigen-display platforms, however, has shortcomings such as requirement of several synthetic steps and cost. Optimization of the balance between vaccine efficacy and the amounts or ratio of attached B-epitopes and additional functional components, and exploring alternative safe and economical materials for multiple antigen-presenting systems instead of Au would help reduce the cost for their practical use. As the optimization of the balance continues to investigate, antigen-display platforms would be an ideal component to develop vaccines. This work was supported by Grants-in-Aid for Young Scientists (B) from the Ministry of Education, Culture, Sports, Science and Technology in Japan to YF (23790144). YF drafted the manuscript. HT helped to draft the manuscript. All authors read and approved the final manuscript.